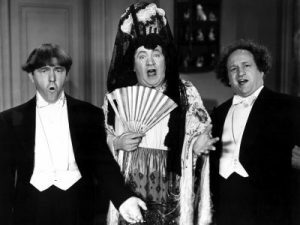 Christine McIntyre was a singer and actress, who is best known for her numerous roles as part of the Three Stooges short films for Columbia Pictures. Christine McIntyre was born in Nogales, Arizona on April 16, 1911, to John and Edna McIntyre, growing up in a family with four siblings. In addition to her physical beauty, she had a lovely singing voice and graduated from the Chicago Musical College in 1933 with a Bachelor of Music degree. Not long afterward, in 1936, she was acting on the stage in Los Angeles, and in 1937 she broke into movies with a small role in Swing Fever leading to a contract with RKO Pictures. This led to her appearing in a number of B-movie westerns for RKO. During this time, she appeared with many comedians in a variety of films, including Shemp Howard, Joe Besser, and Joe DeRita – but not in any Three Stooges short films. That waited until 1944, when shortly after having dyed her hair blond, she signed a ten-year contract with Columbia Pictures Short Films, where she would begin appearing in dozens of short films with the Three Stooges. Her first film with the Stooges, Micro-Phonies (1945) made good use of her singing voice, as she sang ‘Voice of Spring‘ – only to have to later provide the voice for the lip-synching Curly as ‘Madame Cucaracha’! A very funny short film, that demonstrates not only Christine McIntyre’s singing and beauty but her acting and comedy skills as well. She went on to become one of the regulars in the Three Stooges films, playing a wide variety of parts ranging from the girl next door to the saloon girl to the helpless cripple to the gangsterâs moll – and doing them all very well, to boot. After many years, and many dozens of Three Stooges short films, Christine McIntyre fell in love with and married J. Donald Wilson, a radio producer, writer, and actor. Not long afterward, they both retired from making movies and spent the next 30 years working together in real estate. Her husband died in January 1984, and Christine McIntyre followed him only six months later, dying of cancer on July 8, 1984, in Van Nuys, California.